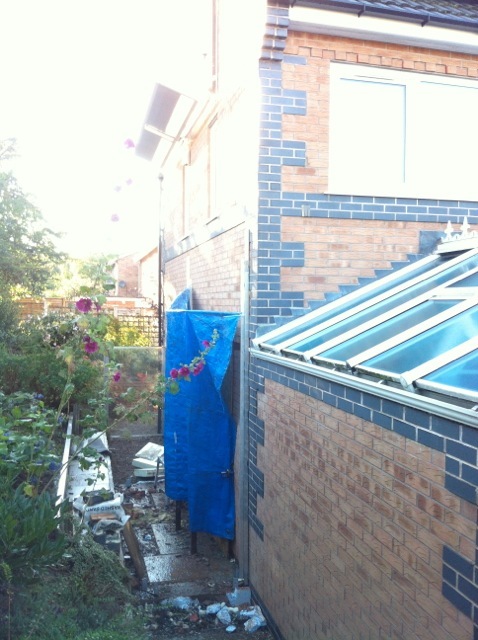 12 Sept 2012: [Extension] Big day for the extension building, this is a point of no return! 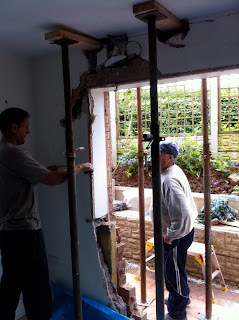 The wall to the dining room has come down, and within a week, our new extension has to take its place, or we will have a very cold house during the winter! We had an imperative to finish all the roof cassettes during Wednesday. 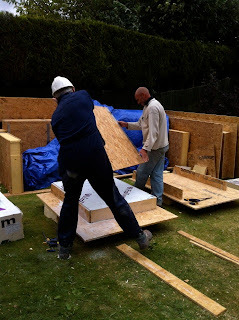 The next day, Thursday is Build-up day! 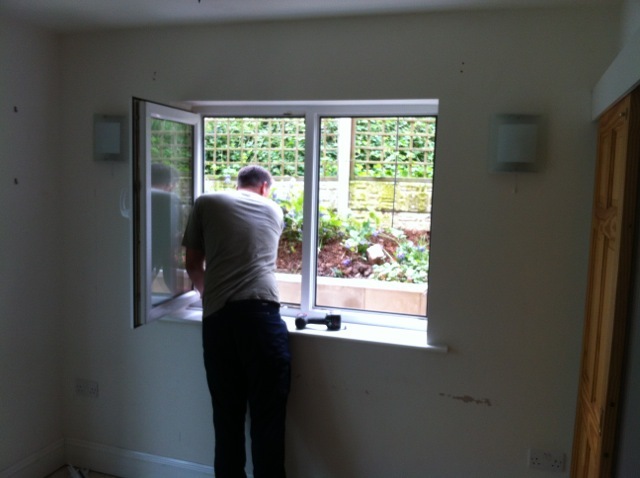 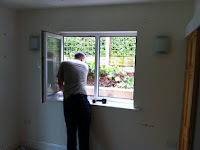 Adam starts taking out the existing window. 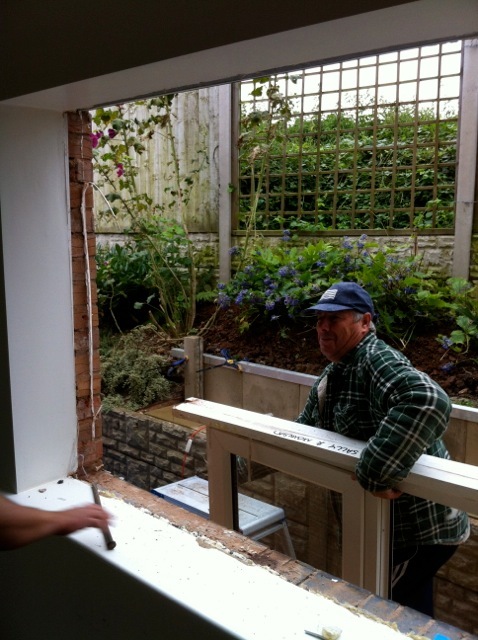 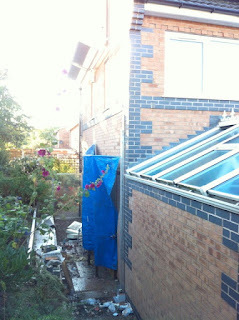 We intend to use it again, temporarily in the new extension until the main window arrives. 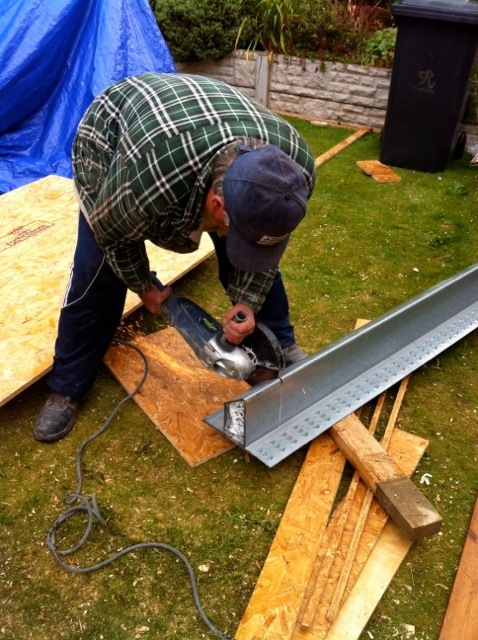 Ken manages to get the frame out, and it is put into store. 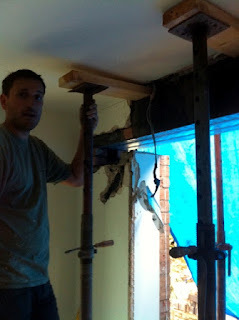 Now the real bashing can begin. Adam works at the window opening, working his way down to the floor level, to the blue brick courses. 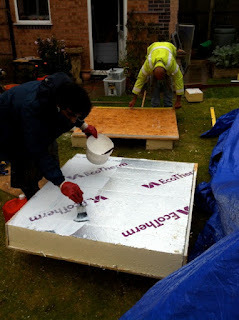 Oh bother, the rain comes down hard for a while, but these guys are undaunted. 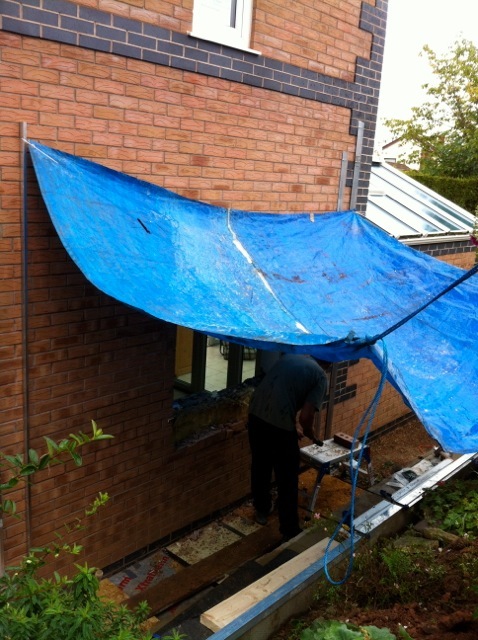 A tarpaulin goes up, and work continues below. Adam makes further progress, with the wall below the old window. 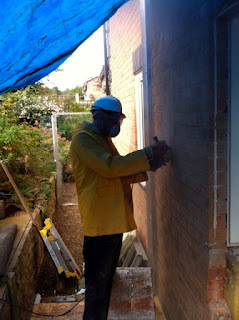 DNC uses his new masonry cutting blade to define the location of the vertical cut in the wall. 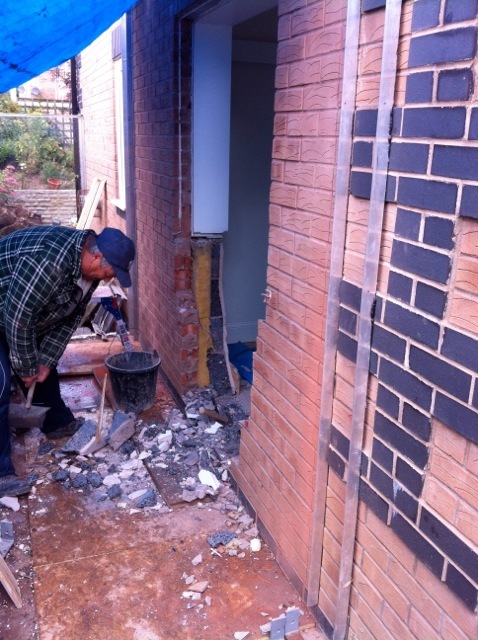 We have reached floor level, Ken clearing away the rubble. 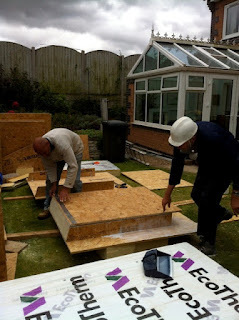 Work resumes after the rain on the two roof cassettes, east and west. 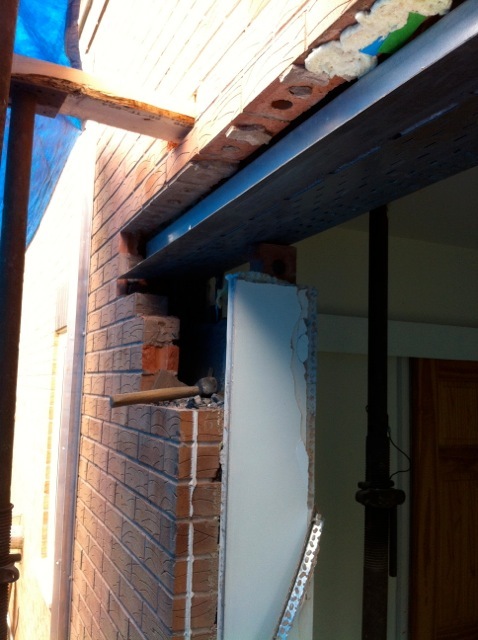 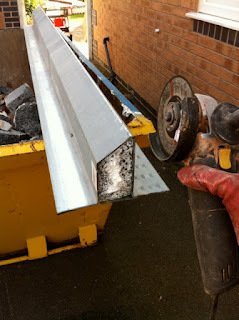 The lintel arrives, but it is a standard 3 metres long. 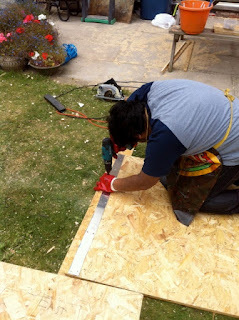 Needs to be cut down to the correct length. 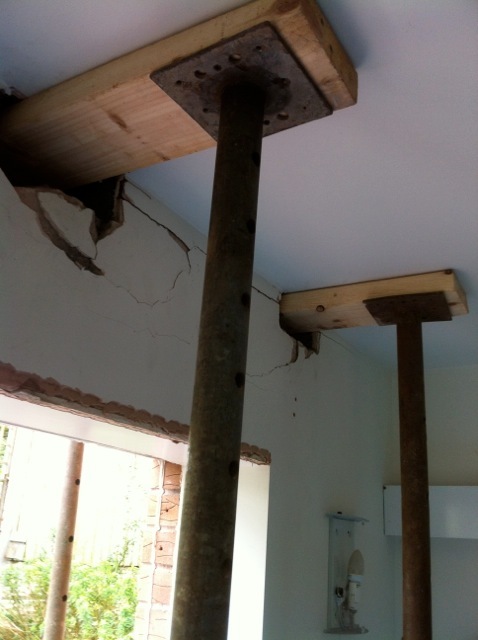 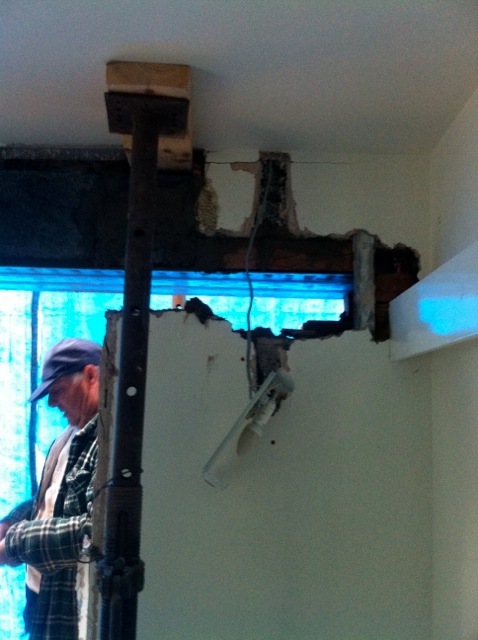 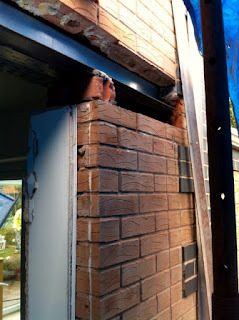 Hole are needed to push timber blocks through, that can support the wall above when props are put in. Adam starts on the blockwork. 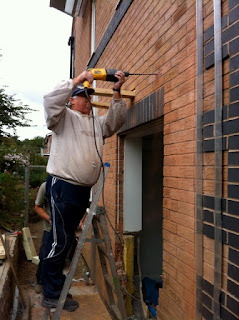 Ken is working on the same holes from the outside. Udayan has turned up to help and is working on the sheets of timber for the roof cassettes. 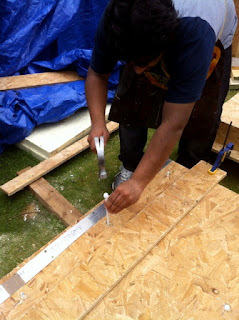 DNC pasting glue into the east roof cassette. Two timbers are through, and Ken is driving a hole for the third. 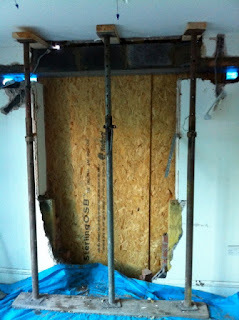 Meanwhile, the east cassette is closed up, ready for nylon bolts. 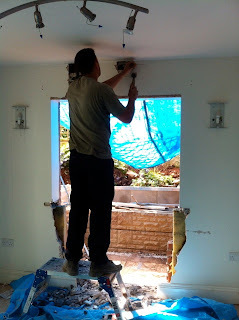 The final sheet must fit the mini-walls exactly, before we screw it down. 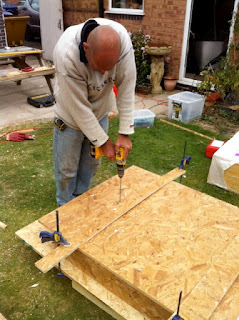 Now Andy drills pilot holes through, to make sure that nylon bolts go through. 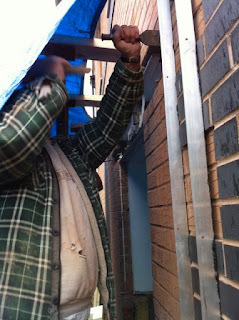 Nylon bolts are pushed through the pilot holes, lightly tapped. Acrow props are now installed and pushing up on the timbers which are supporting the walls above. 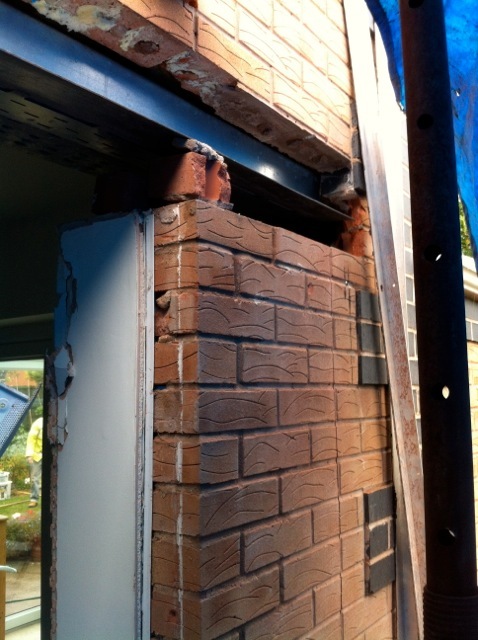 Close up of Acrow props supporting the walls above. The upright cassettes have their nylon bolts tightened up gradually. 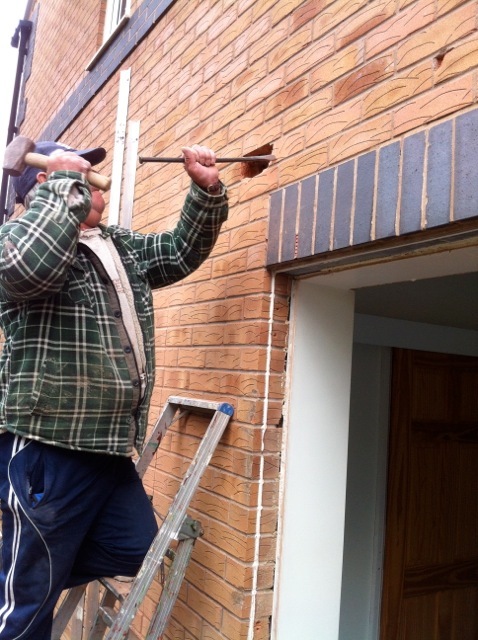 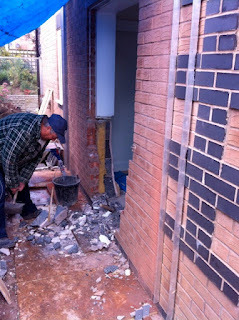 Ken is now knocking out more bricks at each end to make space for the long lintel. 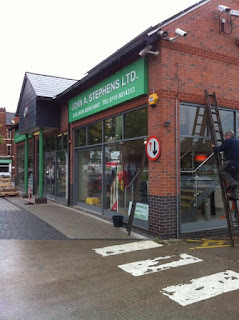 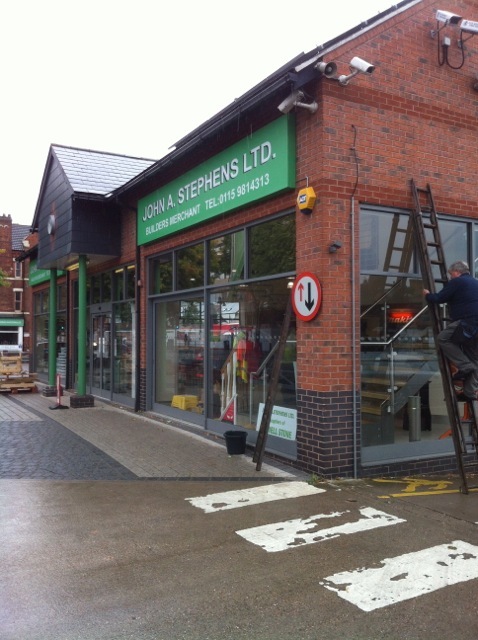 Most of our materials have been bought from John A Stephens. We decided to reduce the width of the opening, so Ken cuts a bit more off with his large Skilsaw. Ken cutting.... 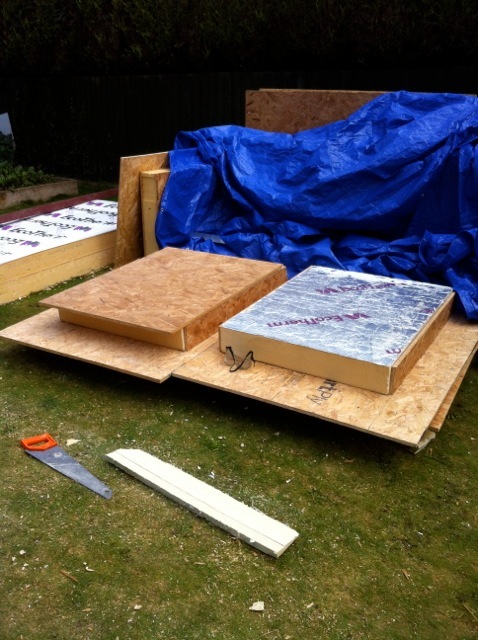 The east and west roof cassettes are made, now it is time for the centre cassette - there will be three in total. 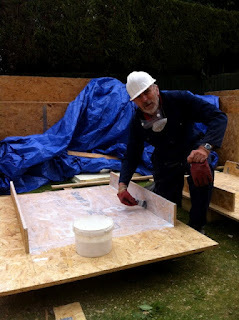 Applying the glue for the final and centre cassette for the roof. Teatime, Lintel is now in position, the West end. Teatime, Lintel is now in position, the East end. 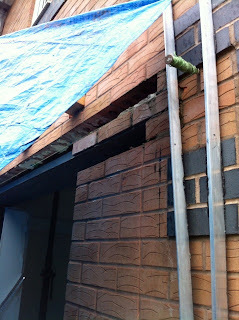 Centre roof cassette is now upright and being tightened up. 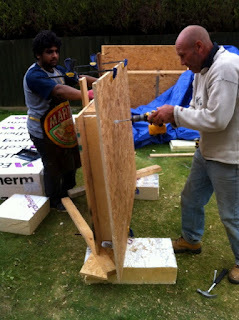 Rain comes back and ends the woodworking day, but Ken and Adam keep working under the tarpaulin. The brickwork is being filled in along the lintel. 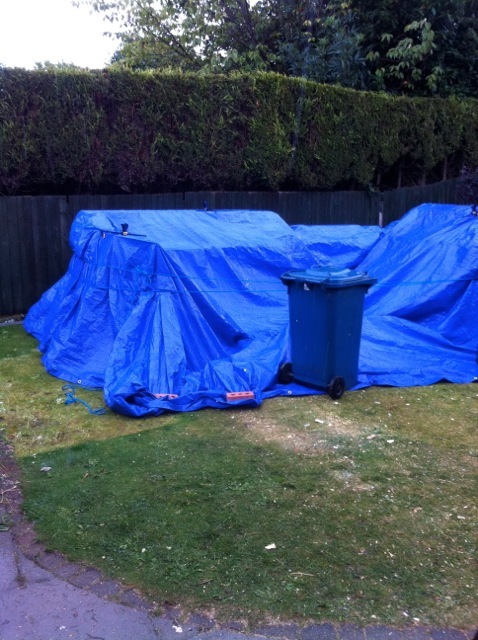 Our woodworking factory is snug and dry under this tarpaulin. 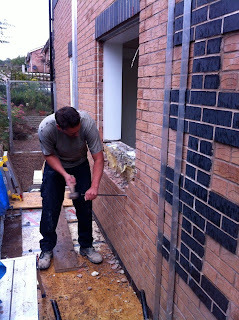 Now the blockwork is also built in along the lintel. 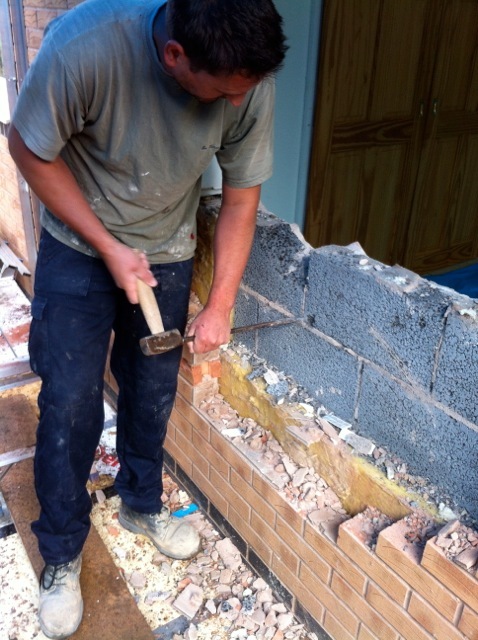 Adam has been placing the blockwork along the lintel. 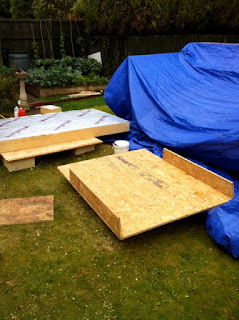 The house needs to be secure overnight, so two boards of OSB prove to be very useful. 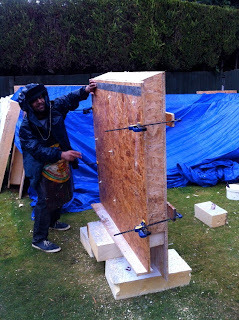 This is lean construction. Minimum waste. 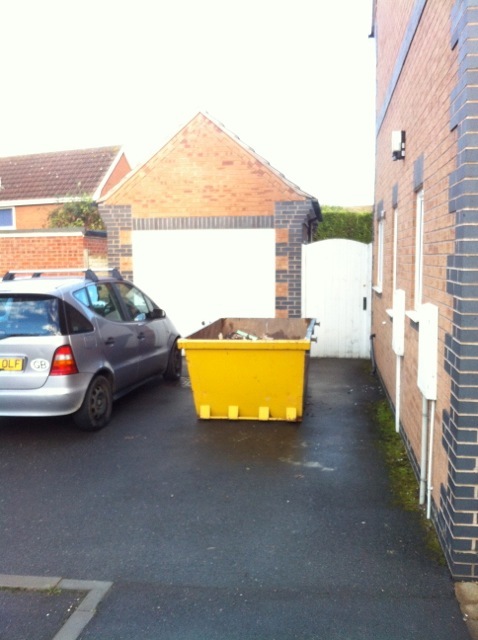 All of the wall taken out does not yet fill half of this smallest skip we can hire. 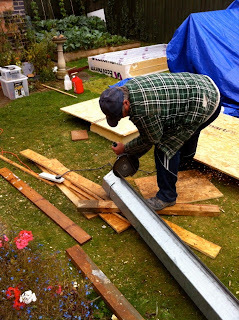 Choosing the right acrow props is really esential for any kind of housework that deems to need it.